Come for a tour! We’d love to show you around! Set on 32 acres with over 20,000sf of indoor lodging and exercise areas, as well as seven play yards and over 70 individual exercise runs, we truly are a RESORT for pets! Whether your pet stays in our huge luxury villas, our uptown suites, or our standard rooms, all our lodging areas are sparkling clean and climate-controlled. Lots of skylights and windows, beautiful décor, and soothing music played 24/7 throughout the building all create a calm environment that helps to reduce the stress of being away from home. Rain or shine, all our canine guests enjoy plenty of break time each day to stretch their legs, get some fresh air, and do their business. Huge outdoor play yards are available for our social guests. And for our guests who prefer to take break time by themselves, there are lots of individual outdoor runs! But if the weather is bad, enclosed individual runs and an indoor social arena can accommodate everyone! Our Resort is located on 32 acres of beautiful land surrounded by trees, and features over 20,000 square feet of indoor lodging and exercise areas. The Resort also has over 70 individual outdoor exercise runs, as well as seven play yards so all our guests can enjoy the fresh air and sunshine during their break times. We are truly a “country club” for your pets! 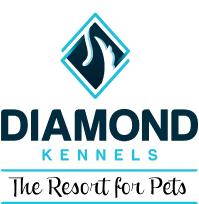 Since 2002, Diamond Kennels has been a family-owned and operated, full service resort for dogs and cats. The business started as a hobby kennel to breed and raise Pomeranians, and from that the idea to board dogs and cats for others developed into a retirement “project.” Who would have ever imagined that it would grow to the size it is today! Almost every year since 2005, there has been construction and changes to the buildings and property, all to improve the care and environment for our guests. From the covered exercise runs in 2005, the lobby in 2007, the indoor arena and additional lodging in 2010, the luxury and upgraded options added in 2015, we strive to offer the highest quality of pet care possible. It is our passion.